In Women and the Everyday City, Jessica Ellen Sewell explores how women experienced urban spaces in San Francisco between 1890 and 1915, and how they negotiated “the gaps between the urban landscape as it was built and as it was imagined to be” (xiii). She builds upon the work of Christine Stansell, Mary Ryan, Kathy Peiss, and Sarah Deutsch who have studied women in the built environment of public space, but who, Sewell notes, have not used the built environment as historical evidence. By examining “the built environment as an active force in the construction of gender,” she reveals the importance of class in women’s interactions with urban space, and shows how gender systems and the built environment were mutually constitutive (xiii). She argues, “The built and imagined landscapes of the downtown interacted with each other, often harmonizing and at other times conflicting, creating gaps that women negotiated in their everyday use of the downtown” (169). Sewell analyzes urban spaces through three types of landscapes: imagined, experienced, and built. The imagined landscape is the landscape as understood by individuals and groups. The built environment includes the physical built environment and its spaces, and the experienced landscape is how actual people use the built landscape in their everyday lives, which largely depended on one’s social position and financial resources. Sewell is particularly interested in the contradictions between the imagined landscape’s ideology of separate spheres (the business district as masculine, the shopping district as feminine) and the built environment where men’s and women’s spaces often overlapped. She examines this period, because women’s public roles expanded during this era and downtown shopping increased as urban areas became increasingly specialized. To explore the contradictions between these three landscapes, she uses diaries, newspapers, maps, photos, existing buildings, trade journals, guidebooks, and etiquette books. She values the repetition and banality common in diaries, which enable her to use these sources to reconstruct the everyday activities and geographies of women. In each of the first four chapters, she examines one type of gendered public landscape and the network of spaces that it constituted. She maps each landscape within the city, examines “the ways material culture marked these sites as classed and gendered,” traces the changes that occurred in these spaces throughout this era, and explores how women negotiated these spaces in their everyday lives (xxxii). In chapter 1, she examines sidewalks and streetcars to compare middle-class and working-class perceptions and uses of these public spaces. For example, in the 1890s, the middle class believed that the streets were a place to move through and women should move through the space of the streets invisibly. In contrast, the working-class saw the streets as a place of sociability. She traces how the middle class increasingly adopted working-class understandings of public space, because as women’s presence in public spaces increased, the imagined landscape evolved to include women as natural inhabitants. This change was reinforced by modifications to the built environment that normalized sociability and visibility in public spaces. For example, window displays of department stores encouraged window shopping and changes in streetcar design and decoration decreased male deference to women.The next three chapters examine shopping and errands, restaurants and dining out, and spectacles and amusements, using the same model as chapter 1—tracing changes in classed and gendered uses and understandings of urban space. Chapter 2 outlines three types of shopping spaces and activities: 1) local daily grocery shopping; 2) short trips to local or district mainstreets; and 3) trips to the department stores and specialized shops of downtown Market Street. She argues that “women’s varied access to and use of these three shopping landscapes helped to construct their social positions and affected how they engaged with the city as a whole” (xxxii-xxxiii). In chapter 3, she explores women’s dining out practices, examining the growth of new types of female-friendly dining establishments and tea rooms, and the careful construction of built environments that signaled femininity and safety within these spaces. She also explores the more economical dining-out options favored by working-class women, and the differences between working-class and middle-class establishments. Chapter 4 examines women’s increasingly radical use of public spaces as spectators and participants in public amusements, including theaters, nickelodeons, parades, and celebrations. Building upon the previous chapters, Chapter 5 examines women’s political appropriation of space. By comparing the 1896 and 1911 suffrage movements in San Francisco, Sewell explores women’s changing uses of private and public space, specifically how women became increasingly comfortable using public spaces to achieve political goals. She shows how women in 1911 appropriated and redefined public spaces such as lunchrooms, stores, streets, and theaters to publicize their political goals. 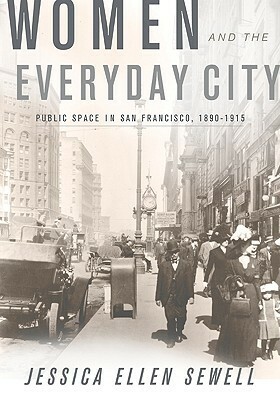 Furthermore, she illustrates how women utilized their everyday uses of public space as a justification for their right to have full access to the public sphere, including the right to vote.Sewell persuasively argues for the interaction between imagined, experienced, and built environments in the lives of women in San Francisco during this era. Her experience as an historian of art and architecture enables her to use the built environment both as evidence of gendered and classed landscapes and of changes of within imagined and experienced landscapes. Furthermore, her work is enhanced and illustrated by her use of diaries, images, and maps as sources in this study of space and landscapes. Her methodology will certainly be of interest to historians of space, gender, activism, architecture, and urban areas. I referenced this book for work (writing a historic context about department stores and theaters on Market Street), but ended up reading the whole thing. The topic is very specific to a time, place, and demographic group, which I think is what makes it particularly appealing to me, who can relate to at least two of those aspects. To a woman living in present-day San Francisco, it was a fascinating study of the way we historically interacted with the urban environment around the turn of the century. As always, it was amazing to think of the restrictions and societal expectations put on women to preserve their respectability in comparison to the freedoms we have today. I really liked the way the author used the journals of three women from different social classes to analyze their shopping, dining and entertainment habits. I got a vivid impression of what Market Street looked like 100 years ago and the activities that went on there - the descriptions of the department stores were especially captivating. The writing was approachable, and there were plenty of good maps illustrating the patterns described. Definitely worth a read, if you are feeling a bit scholarly. This was my second time reading this and it was just as much fun the second time around.